Stop5G.net | Stop5G Related: 34 Studies Shows Cumulatively WiFi Radiation = Dangerous! 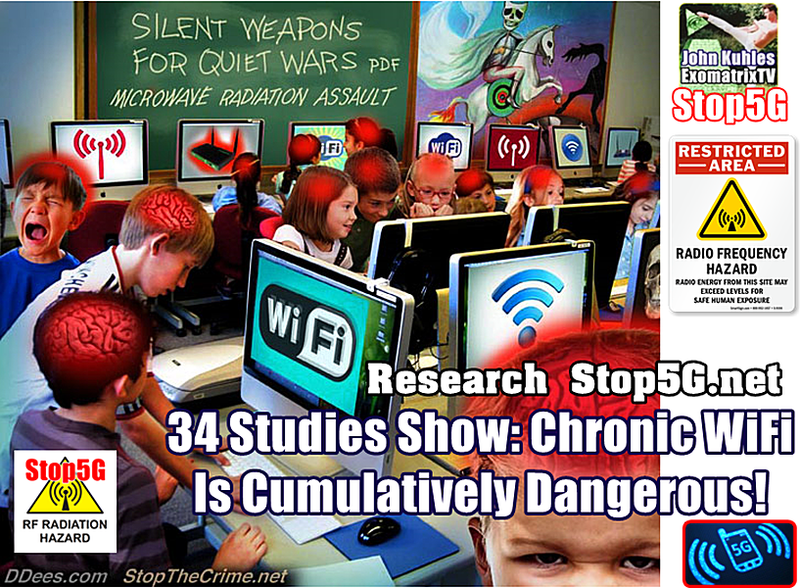 Stop5G Related: 34 Studies Shows Cumulatively WiFi Radiation = Dangerous! Posted June 1st, 2018 by admin & filed under 5G Cancer, 5G Cover Up, 5G Health Risk Assessment, 5G Health Risks, 5G Liability, 5G News, 5G Safety Code, EMF Technology, Microwave Radiation, Mobile Phone Hazard, news, Science, Stop5G, Stop5G News, Stop5G Related!, Stop5G.net, Surveillance Society, WiFi Radiation. It will probably not be one of the most exciting articles on the site here, which we have ever published, but perhaps consider this article more as a ‘shopping list’. It is primarily intended for all those people who can not believe it. That governments really do not protect you, or at the very least, against ‘evil influences’, regardless of their character. And that the evidence of one of those influences, EMS or electro-magnetic radiation, is extremely harmful to humans, animals and plants. , our governments obviously do not care about that in the context of protecting civilians ..! Here is the article that first appeared on the website ‘StopSmartMeters’ (HERE). We lack the time to finish and quote all inquiries; if there are people who are able to summarize (and dare?) the conlusions on the basis of this list, then we are recommended for publication ..! Here is at least the excellent collection of scientific documents that, it should be said again, KEIHARD demonstrate that there are biological effects, even health damage, of the use of WiFi signals. You know, WiFi is wireless internet .. A ‘blessing’ of modern times ..
Below you will find the list with 34 excellent scientific reports. They all concern research on exposure to 16V / m or lower. For example, someone who uses a tablet computer can be exposed to electromagnetic fields higher than 16 V / m. The studies are in alphabetical order. (If you want a list with only the first pages of these studies, then click HERE ) You can, for example, send this article to the school (management) of your children, print this article out or forward it. See the links at the top of the page. These 34 studies show: WiFi = dangerous !! 6. Havas M. et al., 2010. Provocation study using heart rate variability shows microwave radiation from 2.4GHz cordless phone affects autonomic nervous system. European Journal of Oncology Library Vol. 5 : 273-300. http://www.icems.eu/papers.htm?f=/c/a/2009/12/15/MNHJ1B49KH.DTL part 2. 9. Margaritis LH et al., 2013. Drosophila oogenesis as a bio-marker responding to EMF sources. 27. Novoselova EG et al., 1998. Stimulation of production of tumor necrosis factor by murine macrophages when exposed in vivo and in vitro to weak electromagnetic waves in the centimeter range Bofizika 43: 1132-1333. 31. Persson BRR et al., 1997. Blood-brain barrier permeability in rats exposed to electromagnetic fields used in wireless communication. Wireless Networks 3: 455-461. 33. Salford LG et al., 2010. Effects of microwave radiation upon the mammalian blood-brain barrier. European Journal of Oncology Library Vol. 5: 333-355 http://www.icems.eu/papers.htm?f=/c/a/2009/12/15/MNHJ1B49KH.DTL part 2. 7 effects have each been repeatedly reported following Wi-Fi & other EMF exposures. Established Wi-Fi effects, include apoptosis, oxidat. stress & testis/sperm dysfunct; Neuropsych; DNA impact; hormone change; Ca2+ rise. Wi-Fi is thought to act via voltage-gated calcium channel activation.